For the first of these new releases, Shmaltz is expanding the Star Trek beer universe, getting away from Golden Ales and shifting to an Imperial Porter. Star Trek Klingon Imperial Porter, as the brew is called to the delight of fans of the makeup-intensive alien race, is an intense take on the dark style which, according to a press release, features “ruby undertones that pay homage to Klingon Bloodwine and fallen warriors who hold honor above life.” Alright, you had me, and then you lost me. In fact, most of the press release will be over non-Star Trek fan’s heads. “’There is no honor in attacking the weak,’ so take pleasure in besieging this 7.3% ABV Imperial Porter,” the brand writes. “But like this mighty brew, Klingons also have a sweet side: Witness the wedding ritual where the gods forge two hearts so strong that once joined together cannot be opposed. (Just ignore the part of the ceremony where the groom swings his bat’leth at the bride! )” Um, how much research do I have to do to drink this beer? They could at least include a footnote on what episode they’re talking about. 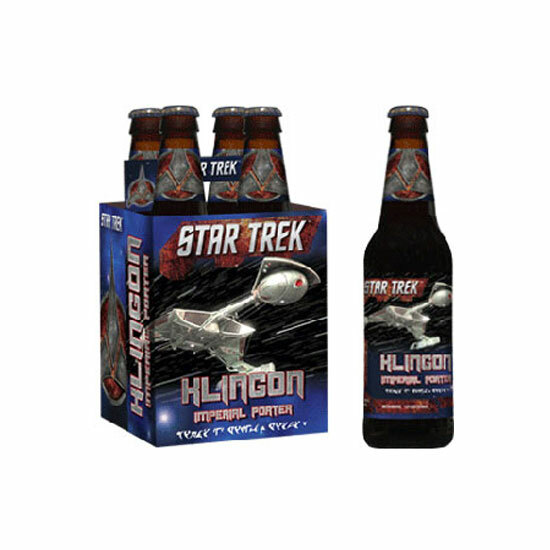 This Klingon-themed libation debuts this week and will be sold as 4-packs in the 35 states in which Shmaltz is distributed. It will also available on draft – at places like that bar you’re realizing you definitely should have not brought your Tinder date to. As for the remaining two Star Trek beers slated to be released later in 2017, Shmaltz is keep the details of those under wraps. But logic and reason tells me a Vulcan beer may be in the cards. Maybe “The Search for DoppelSpock”?